No. 1045 is a 1250°F (677°C), high temperature horizontal air flow cabinet oven from Grieve, currently used for heat treating at the customer’s facility. Workspace dimensions of this oven measure 38” W x 38” D x 38” H. A 350,000 BTU/HR is installed in a modulating natural gas burner, while a 2000 CFM, 2 HP recirculating blower provides horizontal airflow. 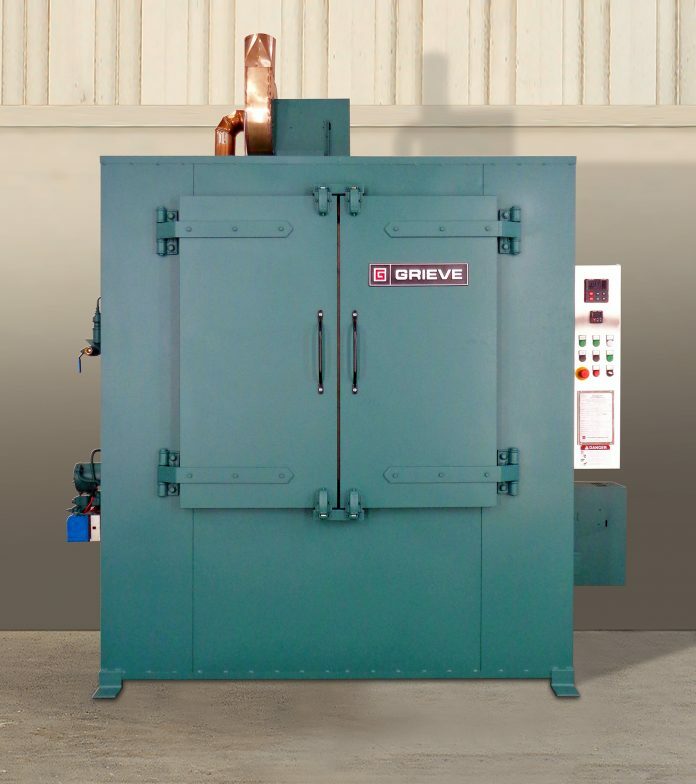 This Grieve horizontal air flow cabinet oven features 12” thick insulated walls comprised of 2” of 2300°F ceramic blanket and 10” of 10 lb/cf density rockwool. Features include an aluminized steel exterior, 16 ga stainless steel interior and a 325 CFM powered forced exhauster. Additional features include inner and outer door gaskets, inner gasket seals directly against door plug and outer gasket seals directly against front face of oven, plus all safety equipment required by IRI, FM and National Fire Protection Association Standard 86 for gas-heated equipment. Controls on the No. 1045 include a digital indicating temperature controller. We started out in 1949 with one goal in mind…to create a line of industrial heat processing equipment our customers could believe in. Today, while much at Grieve has changed, our commitment to that goal is steadfast. At Grieve, you’ll find quality at each and every step of the design and manufacturing process. With CAD/CAM/CAE design equipment and ever-improving manufacturing procedures, we make the very best ovens and furnaces possible. Most important are the people of Grieve. Our office staff, engineers, manufacturing and shipping personnel are all dedicated to your continued satisfaction. Ovens and furnaces for which there simply are no equals…Grieve.